We didn’t think we would have a show this week but the stars aligned and we were able to get a show this week. In this episode we talk about our lists and our preparations for the So Cal Open that is this weekend. We also talk about our ITC rankings, our goals for the end of the season, and what we need to do to achieve those goals. 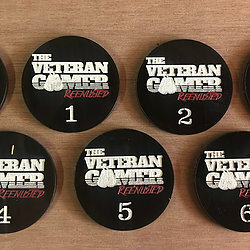 Hammerhead Games did it again and created some VGR branded objective markers. This was a surprise and I didn’t think he could get the logo onto that small of a target, but Tony made it happen. You can check them out on Hammerheadgames.net or the MERCH page on our website. DEAD SWARM is releasing a new single “Coven” on October 26th. You can preorder your download on Amazon Music or on Apple Music. What we are drinking? Since Ray is a solid dude and knew I was on the road he picked up some beer from one of his favorite breweries. We drink the Hopped Up Double Red from Garage Brewing Co.